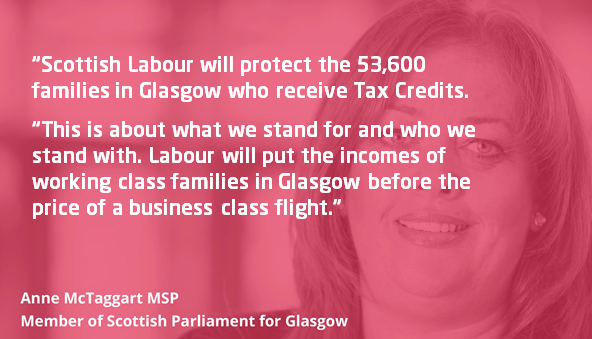 Working families in Glasgow will be protected by Tory cuts to Tax Credits by Scottish Labour. The party announced that they would protect working families in Scotland from tax credit cuts using the new powers coming to the Scottish Parliament. Party leader Kezia Dugdale announced the move in her keynote speech to Scottish Labour conference in Perth last week, outlining that the party would pay for the move by cancelling planned SNP tax cuts on air passenger duty and Tory cuts for higher rate tax payers. Glasgow Labour MSP Anne McTaggart said the move could protect as many as 53,600 families in the city. “Tax credits work. They make work pay for families in Glasgow and across Scotland. They lifted hundreds of thousands of children out of poverty, and they allow families to aspire to more than just making it to the end of the month. “That’s why the Labour Government introduced them in the first place and why Scottish Labour would use the powers coming to the Scottish Parliament to reverse the Tories plans to cut them. “This is about different choices between Labour and the SNP when it comes to priorities. It’s about standing up for working families. “The SNP want to make a plane ticket cheaper, I don’t think that’s the right priority when there are families in Glasgow who can’t afford the weekly shop. This entry was posted in Glasgow, Tax Credits and tagged Glasgow, Scottish Government, Scottish Labour Party, Scottish Parliament, Working Families. Bookmark the permalink.